This thoughtfully formulated face oil provides just enough slip for silky, softened skin, yet feels lightweight and balanced. Makeup glides right on over it, and my oily skin doesn’t turn into a slick hours later the way it can after using heavier oils and balms. 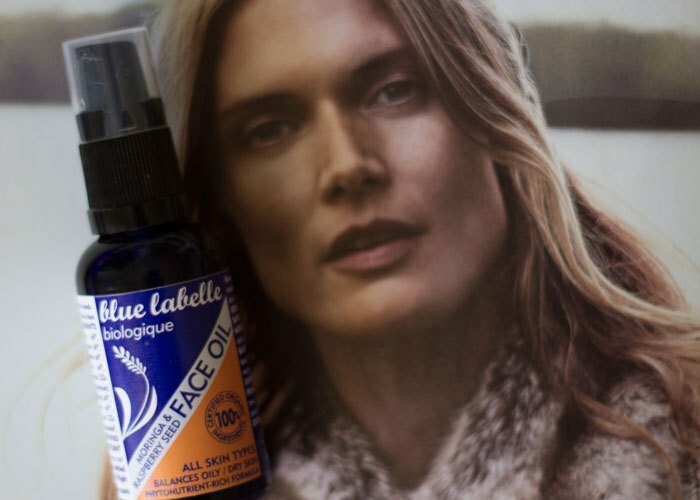 That’s because Blue Labelle chose just the right ingredients to craft this stellar face oil. Jojoba, safflower, morgina, camellia, red raspberry and evening primrose oils make up the base. These are some of favorite picks for oily and acne-prone skin. As mentioned in many previous posts, jojoba oil has a special place in my heart — and it does something very special to my skin. That combined with evening primrose, an oil I also take internally from time to time, help keep my skin looking clear and healthy. Safflower oil also has skin-clearing properties, though it’s not one I’ve experimented with a lot on my own. However, it’s one of those ingredients that my skin has never had an issue with when used in blends. My facialist will also at times use pure safflower oil on me for oil cleanses, and my skin responds well! 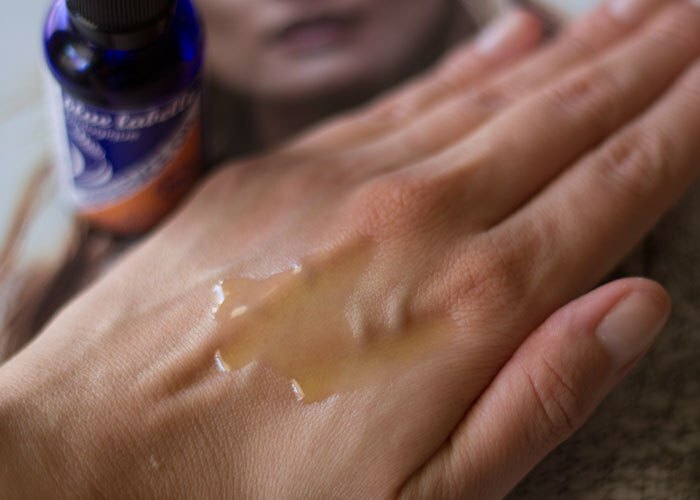 Seeing Blue Labelle use it in this formula for oily folks further reinforces the idea that it does some powerful work! Moringa, camellia and red raspberry oils add major antioxidant power to the blend, protecting the skin from the elements. It takes just one full pump to cover my face and feel perfectly moisturized and ready for the day. One cooler days or when my skin is a little thirstier, I’ll add an additional half-pump. I like the pump packaging, as it gives a perfect measurement of how much to use (vs. dropper bottles, which can make a heavy-handed person like me get a little too indulgent!). This face oil also wins in the affordability department; it costs just £22.00, which is about $32 USD. I’m not quite sure if Blue Labelle has stockists in the States, though, so you’ll get dinged on shipping if you aren’t in the U.K. Beyond all those little details, let’s get to something very important: Scent. If I don’t like the way something smells, no matter how many luxurious, organic, exclusive ingredients it contains, I just won’t use it. Scent is important and part of the ritual and experience. And Blue Labelle got it right with the Moringa & Raspberry Seed Face Oil. It has a sweet and mildly earthy scent thanks to geranium (which I pick up very easily) and frankincense. There’s a touch of spice from the rosemary, but it’s not overpowering at all. My nose gets a tiny bit of juniper on the finish, as the oil dries, but it’s very faint. Overall, it’s a sophisticated, unisex scent that is subtle and clean. Perfect for a daily face oil! As for the claims this facial oil makes — balances, nourishes, clears — I’d say Blue Labelle is spot on. I very much enjoyed the texture and smoothing effects of this oil. While it’s not an active acne treatment by any means, with regular use in your routine, you’ll see how your skin responds to those powerful carrier oils that can do so much for acneic skin. I’ll sing the praises of jojoba oil day in, day out, and when you pair it with known skin healers such as evening primrose and safflower, you’re set up to win the clear skin game. I think Blue Labelle’s Moringa & Raspberry Seed Face Oil is fantastic. It’s an affordable, truly organic option for those looking for powerful, clean skincare. It’s a definite “recommend!” from one oily-skinned girl to another, and I’d repurchase it if it were readily available in the States (hint, hint). Have you tried anything from Blue Labelle? What are your favorite carrier oils for oily, acneic skin? What are your favorite international beauty brands? Tell me your thoughts in the comments section!